A federal judge has given final approval to a $25 million settlement to litigation against Trump University, a now-defunct real estate seminar program once owned by Donald Trump. Trump had agreed not long after his election to settle two class-action suits filed by former customers of the program in California, as well as a New York state lawsuit. 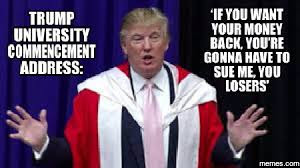 The suits argued that Trump University defrauded customers, some of whom paid more than $30,000 to participate in the seminars, with false advertisements promising that they would learn Trump's personal real estate tricks and that Trump had hand-picked seminar leaders. In depositions, Trump acknowledged he did not choose instructors.